Taylormade wants to beat the world’s best. We see if they’re on the right path. When Paul Taylor grants you permission to ride his super exclusive (meaning there’s only one) carbon fiber Moto2 race bike, it’s not something you turn down. While I’ve been fortunate enough to ride almost all of the latest and greatest production sportbikes around, there’s still nothing like riding a motorcycle specifically built for lapping a race track as quickly as possible. Production sportbikes are engineered with the track in mind, but with street compromises, because really, the vast majority of owners are likely to never bring their bikes to the track. 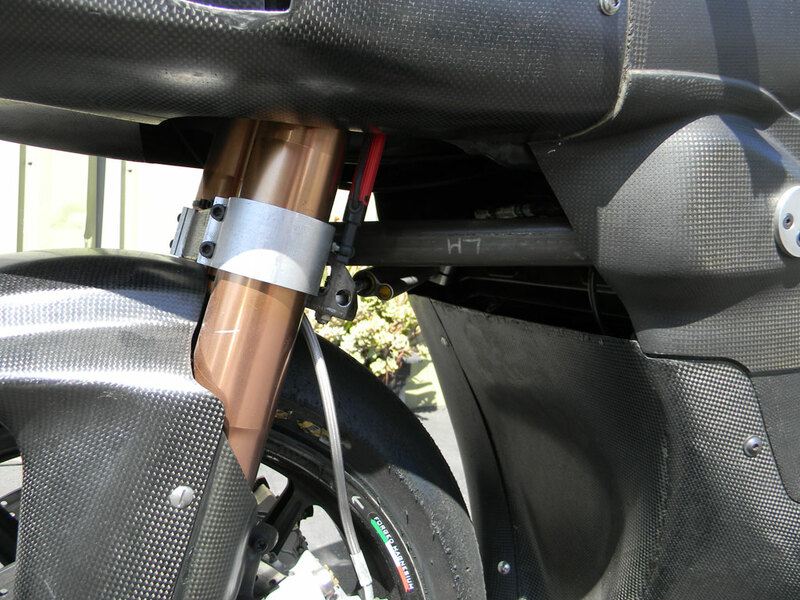 The Taylormade/Brough Superior Carbon Fiber Moto2 race bike is different. The brainchild of Paul Taylor and business partner/designer John Keogh, the one-of-a-kind racebike is intended to take on the Moto2 establishment by examining the racing motorcycle, inch by inch, and exploiting any advantage they could find. That means street concerns were thrown out the window in favor of extracting every last bit of speed possible. 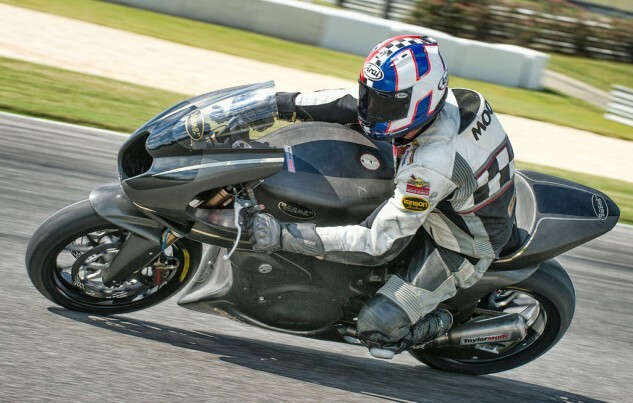 Paul Taylor and John Keogh are hoping this carbon fiber Moto2 racer will challenge the current establishment. The two main advantages Taylor and Keogh believe they have over the competition is its carbon fiber composite construction for the entirely monocoque chassis and the Hossack-style (it’s more BMW Telelever, actually) A-arm front suspension. The former allows the latter, as the chassis was built specifically with this purpose in mind. Relocation of the radiator to the rear of the bike frees up space for the A-arm mounting points. And by separating braking and suspension forces, stiction — the main disadvantage of a traditional fork at extreme lean angles — is no longer an issue. Powered by a spec Honda CBR600RR engine putting out approximately 120 hp at the rear tire, the project allowed Taylor and Keogh to focus on designing and fabricating the rest of the motorcycle. The article above outlines the creation of the bike and provides all the details. This piece will focus on how the bike is to ride. Lead development rider and former Buell test rider, Shawn Higbee, has been responsible for much of the development on the Moto2 racer. He was chosen for the role by Keogh as they both worked together at Buell. Not to be confused with the banked oval that NASCAR runs and its infield course, the Las Vegas Motor Speedway grounds includes a separate, dedicated road course adjacent to the oval which is used for motorcycle racing, among other things. While flat and featureless, it’s actually a worthy proving ground for any motorcycle because of its mix of fast sweepers, tight corners, and tricky layout. Hopping on the bike, I’m surprised how roomy it is. There’s plenty of real estate in the saddle to move around, but there’s also a slightly long reach to the bars as well. While I initially wasn’t keen on the reach, in a full tuck my elbows and knees never touched, even as I sat as far forward as possible. Prior to going out for my first session, I asked Higbee to brief me on what to expect with this bike. Both he and Taylor warned me the riding dynamics are different than what I’m used to because of the A-arm front suspension. Having ridden BMW motorcycles with a similar suspension setup, I remember the feeling of negligible nose dive when on the brakes. Taylor and Higbee assured I would feel some dive, but not as much as a traditional fork setup. 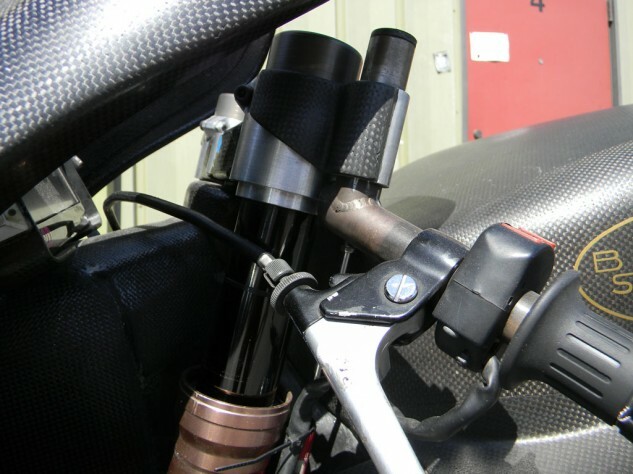 While slightly hard to see, the carbon fiber plate attached to the fork tube and clip-on are to help reduce flex at the bars, an early complaint from Higbee. Electronic aids are limited per Moto2 rules (no traction control, for example), but data acquisition is allowed. The Taylormade racer has roughly $10,000 worth of equipment including a GPS, and sensors recording throttle position, front and rear suspension travel, and brake pressure. These tools allowed Taylor to discover their original swingarm design was the culprit for front-end chatter. With nothing left to ask, I clicked the shifter up for first gear (race shift, remember? ), and crawled my way down the pits. As I bounced the bike up and down it was staggering how soft the suspension felt — both ends were wallowing like a Cadillac — which Taylor assured was absolutely normal. Sure enough, at speed the bike feels anything but soft, transmitting every ripple of the road back to the rider — not in a jarring way, but in an informative way, letting you know what the pavement is like underneath you. Wanting to get as many opinions of the bike as possible, Taylor gave veteran racer Pat Moody a few laps aboard the carbon fiber Moto2 racer. Piddling around at pit speeds and wicking the throttle on track are completely different areas, and for my first session the goal was to reacclimate with the track and get comfortable with the bike. The former wasn’t so bad, as I remembered where to go in just a few laps. The latter, however, took a little longer. Despite all the talk about the suspension before my session, my thoughts immediately turned to the engine once on track. While “only” making around 120 hp, the CBR600RR engine delivers its power in a completely linear, yet still hard-hitting, fashion. The torque curve is broad with power seemingly everywhere. The bike was fitted with taller gearing better suited for the long straights at Auto Club Speedway in Fontana (Taylor’s local track), but the broad spread of power masked this minor oversight into a non-issue. This not only felt like a tuned 600, it felt like a proper 750! And to think, World Supersport engines make even more power. My amazement with the power was soon replaced with confusion as I braked for the first turn. I remembered the words about the front end feeling different than what I’m used to, but I could feel the front start to dive then abruptly stop halfway through its stroke. Thinking this was normal, I continued my arc through the turn but had zero feel in the front. Combine this lack of feel with the constant reminder that crashing was not an option, and you can understand my lack of lean angle seen in these pictures. A broken fork cartridge severely limited any front end confidence I had in the bike, allowing this R6-mounted rider to easily pass me on the outside. The comparison between the two bikes is interesting, as a stock R6 has a 24-degree rake compared to 16 degrees on the Taylormade/Brough Superior. R6 trail is 3.8 inches, while the Taylormade was set at 4.1 inches. Back in the pits, Taylor and Higbee noted my impressions, but I could tell they had their skepticism. Just to make sure, Higbee hopped aboard and took the bike for a spin. When he came back saying the same things I was saying, it not only meant self-validation, but that the two of us could work together to make the bike better. With the 43mm Traxxion Dynamics fork cartridges, the right tube primarily focuses on rebound adjustment while the left handles compression. After twisting knobs and adding/subtracting turns, no changes were happening on the compression side. After practically dismantling the fork, we discovered that somehow the fork cartridge had been damaged since the last time Higbee rode the bike — odd considering Taylor said the bike had only been displayed at shows both in the States and in Europe since then. A replacement part was ordered but wouldn’t arrive until morning, so to salvage what was left of my only riding day, extra fork oil was added, and the remaining (working) cartridge was dialed completely in as a band-aid fix to compensate for the broken counterpart. The best compliment I can give the A-arm design of the front suspension was that I hardly noticed a difference between it and a conventional fork once we were able to work around the damaged cartridge. Another ride with a properly functioning fork is in order to truly gauge its performance. While definitely not the preferred method, the fix worked — or was at least good enough to get me through the day. And after giving it a shakedown run, Higbee confirmed the bike was feeling more like its usual self. That is to say, grabbing the Brembo brakes is met with predictable dive. In fact, had I not known about the A-arm suspension I would have assumed the bike had a traditional fork. Turn-in is lightning-quick, thanks to its 315-pound wet weight, which also enables mid-corner corrections with just a thought. I’ve never ridden a 250cc two-stroke GP motorcycle before, but I imagine a machine of this caliber would be required to best the agility of the Taylormade/Brough Superior Moto2. Surprisingly, the biggest challenge for me to wrap my head around was the incredible amount of grip and lean angle allowed by the Dunlop racing slicks. The 125/75-17 front and 200/55-17 rear have more side grip than I’ve ever previously experienced. Having ridden numerous production sportbikes in the past with 120/70-17 fronts and a myriad of rear tire sizes, I’d gotten a general sense of how far I could lean over before my knee touched down. Here, I felt like I had gone beyond that personal mark and there was still plenty of air between my knee and the ground. With more time I’m sure I would have adapted to the lean angles possible, but now it’s easier to understand why so many on the Moto2 grid have elbow sliders on their leathers these days. Shawn Higbee went on to race the 600cc Moto2 machine the following day in the WERA Formula 1 race, the premier race of the day with the fastest riders on their fastest bikes. He finished second against a field of literbikes. Overall, the riding experience was very easy to adapt to. For the average rider (me in this case) Taylor, Keogh, and Higbee developed the bike to feel like the most well sorted 600cc motorcycle you’ve ever ridden. The power is immense but not overwhelming, while the snarling growl of the exhaust note at full song is truly addicting. The GP shift pattern never let you forget you were riding a race bike, and the incredible agility was something I’ve rarely experienced before. It’s unfortunate the fork cartridge was damaged, but this only means I’ll have to try it again when it’s fixed! With no prior experience on Moto2 machines it’s difficult to gauge where the Taylormade/Brough Superior entry stacks up, but Paul Taylor is well aware there’s still a steep hill to climb before he can challenge the Suters and Kalexs of the world. And while Higbee has been an excellent development rider, the search is still on for a young, talented American rider who can adapt to the nuances of the Taylormade racer and help bring development forward. Oh, and being able to bring sponsorship dollars would be a huge plus as well. If you’re this person, or think you know someone who is, visit www.racetaylormade.com to contact Taylor. Ultimately, the plan is to enter as a wildcard in the second Moto2 race of the 2014 season, at the Circuit of the Americas in Austin, Texas. Get price quotes for Other from local motorcycle dealers.